These temporary electro-tats embed LED lights, a microcontroller, and conductive paint is a type of biohacking which create a kind of biosensor circuitboard on the skin. These aren't just for aesthetic reasons either because, as website Motherboard, who first reported on the tats point out, they could also be used to "monitor a child’s vitals after a surgery, or provide a less public (or more, if you choose) display of fitness tracking." They could also be used to "transfer health data from the micro-controller to an app on your mobile device." and "authorize payments in a similar fashion to Apple Pay." 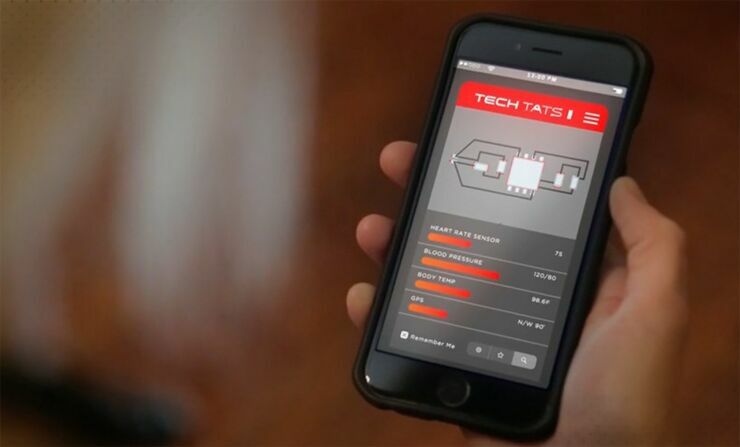 Tech Tats are still only in the prototype phase and there's no word yet on when exactly they'll be available to the public—although they have hinted that their biohacking products will be affordable and may come in a "Band-Aid-like package that will allow users to buy them in bulk." Still, it's probably the kind of wearable subdermal implant technology that we'll be seeing plenty more of. Accessible tech that can monitor health, look good, and function in collaboration with our other devices. Biohacking is best described as a "Do-it-yourself biology, a kind of social movement in which individuals and organizations pursue biology and life science with tools equivalent to those of professional labs." It strives to aid cognitive modulation and human enhancement. Here's what Fjord Austin say about their "biowearables:"
We’re excited to debut TECH TATS, our exploration into the use of skin-mounted components and conductive paint to create circuitry that lives on the human body in the form of a tattoo that has the capability to collect, store, send and receive data. 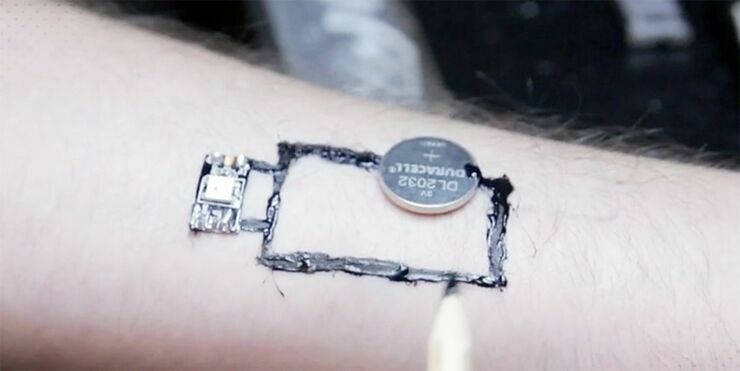 Tech Tats are what we’ve dubbed biowearables: wearable technology that isn’t just, say, strapped to the user’s wrist, but interacts WITH their wrist. (In this case, in the form of a tattoo.) In other words, you’re eliminating clunky, expensive devices with a low-interference, low-cost, and low-hassle alternative, and using the user’s skin as the interface. It’s technology that is, in a sense, part of the user. The result? Total integration.